» 2018 » January The Rev. Wil Gafney, Ph.D. In the Name of the God who breathed us into life, breathes through us, and will return our breath to us at the resurrection. Amen. In the first phrase, In beginning, He, God created—just two words in Hebrew בראשית ברא, God is grammatically masculine, which doesn’t necessarily mean that God is male, but does give us the masculine language we use so often in the church. In beginning the work of creation, God created the heavens and the earth, which in a world that only knew one planet that they thought was the center of creation, that didn’t know the word “planet” or that the stars were planets and other worlds—in that world “the heavens and the earth” meant everything in creation, even what they never could have imagined beyond the stars. Genesis 1 marks the beginning of our world if not the beginning of all things, the beginning of Israel’s story, and the beginning of our scriptures. It is God’s resume and self-introduction. The God we meet in Genesis is more than we could have imagined and has spawned a whole industry of interpreters, theologians, and biblical scholars who spend a lot of time on basic math: God is One; there is God and the Spirit of God in this passage. How many is that? If you want a classic explanation of the Trinity, call Father Andrew, or just wait until Trinity Sunday (also known as Heresy Sunday for the many folk failing at holy arithmetic). Today I don’t want to distinguish God from the Holy Spirit, I want to talk about the Holy Spirit as the manifestation of God that is active in our world, speaking it into life, breathing through it and through us. The Spirit of God is the Breath of God, a mighty wind moving through the world, stirring up holy trouble, fanning the flames of holy passion. When was the last time you got into holy trouble? When was the last time you were caught in the grip of a holy passion? The Spirit of God unites our lessons from Genesis and Mark. In Mark she bears witness to her beloved son, Jesus, and is promised to those who are baptized. The gender of God gets really interesting when you thing about the Incarnation—the Holy Spirit who spoke life into the womb of the Blessed Virgin is also feminine. No man will be able to claim Jesus as his son; he is more the Son of Woman than the Son of Man. And the same Holy Spirit who spoke creation with “Let there be…” and crafted a holy child, with a word that was not heard, that God, that Spirit is the inheritance of the baptized. This is our God and she loves us dearly, to life, to and through death, back to life. In Mark 1, the Virgin’s son was baptized, his baptism a visible sign of the baptism of the Holy Spirit that enveloped him and also envelops us at our baptism. The same Holy Spirit who pulsed over the waters of creation fluttered visibly from heaven to earth to claim Jesus as her child. In our baptisms she claimed us as well. We have the same Holy Spirit as Jesus. We walk through this world animated by the breath of the living God. The troubles of the world are many and great but no match for the God who fills us and breathes in and through us. The image of God claiming Jesus in baptism is for us, so that we might have an image of ourselves forever in the embrace of God and know that there are no limits for what God can do through us. 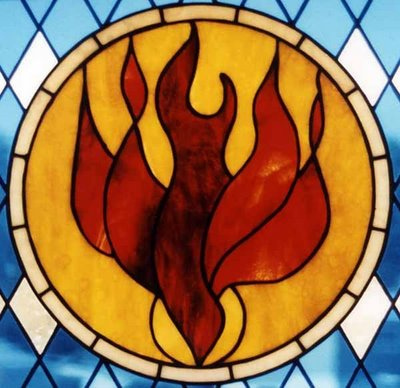 In Acts 19, the promise of the Holy Spirit appears to have been hindered by an inadequate baptism, the baptism of John rather than the baptism of Jesus. When the group was properly instructed and baptized in the name of Jesus, the Spirit poured out on the little band with dramatic evidence. (A cynical or uncharitable reading might see Paul being presented similarly to Jesus and John—right down to the twelve disciples—to establish his credibility.) This is an important story but let us not get stuck there, policing other people’s baptisms and executions of the sacraments. In these three texts the Spirit is powerful beyond measure, and at the same time, tenderly loving and immanently present. We are never alone. God is always with us. God’s Spirit has been present in and on the world since the dawn of creation and has never left. The fires of the Spirit will burn even higher at Pentecost but she has always been here, loving us, claiming us, empowering us. The power of God’s spirit is on full display in Psalm 29; the power of words whispered in a holy wind. God’s thundering voice unites Psalm 29 with Mark 1. The voice that shook the world in the psalm is the voice that splits the heavens in Mark. In the psalm God’s voice is the orchestra of creation: rumbling thunder, crashing waves and the crackle of lightning and fire. The power of that voice can peel the leaves and bark off the trees and shatter them into splinters. And God uses that voice to speak to us of her love. What shall we do with the power that God has breathed into us? How shall we use our words? The world is hungry for God-breathed holy words. How do you tell the story of God’s love? To whom are you telling the story of God’s love? When was the last time you conspired with God? To conspire is to breathe together. When was the last time you returned your God-given breath to its source to breathe with God in the holy kiss that is prayer? The season of Epiphany is a season of revelation, illumination, and discovery. I invite you to discover the power of the Holy Spirit in your life. Let her speak life-giving words through your words. Feel her in your every breath, for God’s voice still speaks in wind and water and her Spirit still bathes the baptized. Listen for her whispers on the winds. Amen.